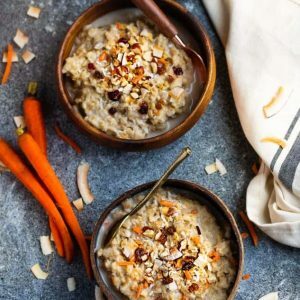 This Carrot Cake Oatmeal recipe is the perfect hearty and healthy breakfast. It’s loaded with grated carrots, coconut milk and topped with nuts, shredded coconut and dried fruit – all the flavors you love in carrot cake. Breakfast will always be a a favorite at our house. Especially when it involves anything with oats. I am usually prepping our oatmeal the night before and a few weeks ago decided to make a spring version. My husband loves carrot cake and since Easter is just around the corner, I figured it was the best time to switch things up. 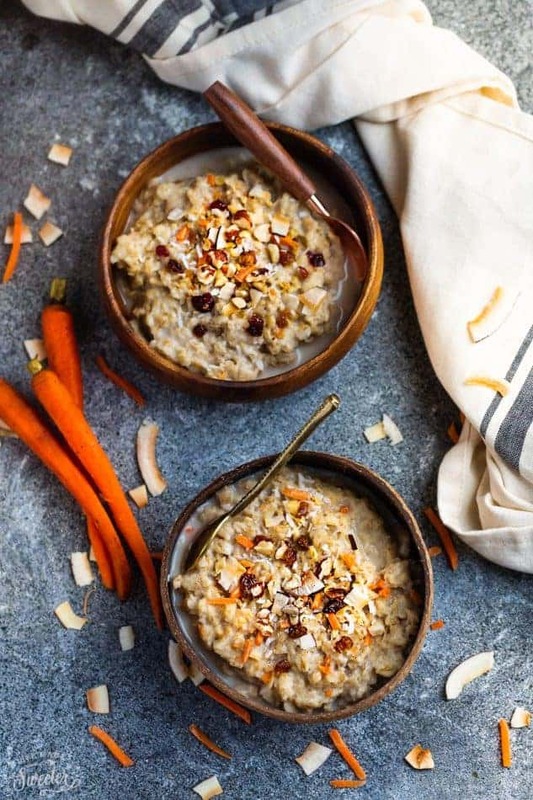 This Carrot Cake Oatmeal is healthy, hearty and so comforting and just perfect for those of you that are carrot cake fans. 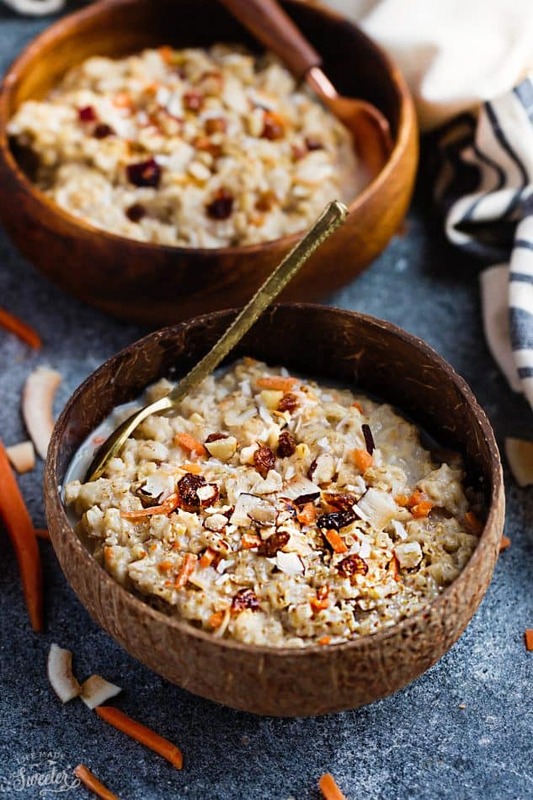 It has all the flavors you love about carrot cake packed into the goodness of a nutritious bowl of oatmeal. shredded and toasted coconut chips. Feel free to throw in all the common add-ins for carrot cake or switch things up to your liking. This oatmeal is loaded with nutrients and will keep you full for hours – which is perfect for any busy person on the go. 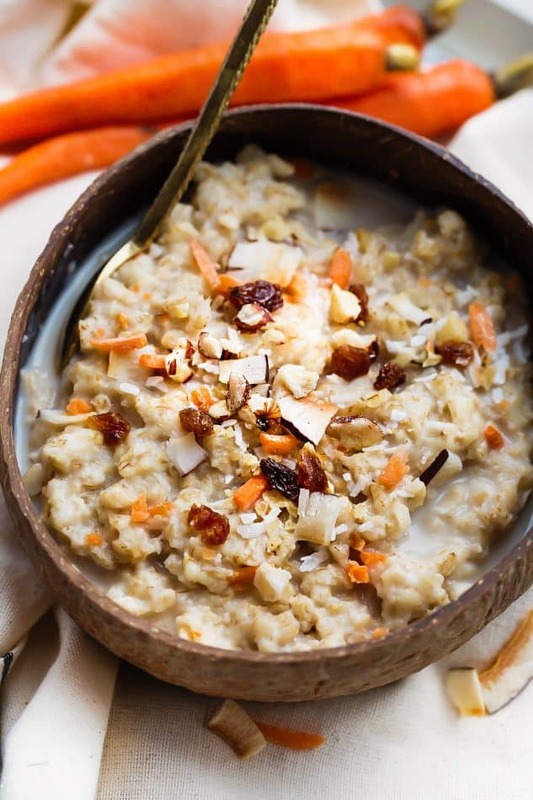 This oatmeal is loaded with grated carrots, coconut milk and topped with nuts. Has all the flavors you love in carrot cake. In a medium sized pot over medium heat, combine the milk, water, cinnamon, ginger, nutmeg, cloves and salt. Stir in the grated carrots and oats. Lower heat if mixture starts to boil. Cook for about 12-14 minutes (depending on how thick you like the oats and the brand), stirring frequently. When the mixture has thickened up, remove from heat and stir in the vanilla extract, maple syrup, half of the shredded coconuts and half of the nuts. Remove from heat and portion into bowls. Top the oatmeal with the remaining pecans, currants and shredded coconut and more coconut milk or maple syrup if desired. Sprinkle with more cinnamon and top with raisins and toasted coconut chips, if desired. Breakfast is definitely a favorite in my house, too! And when it comes to oatmeal, I love experimenting with new flavors! This carrot cake version is calling my name. Such a fun way to jazz up oats, Kelly! I know my husband would devour this! Love this twist on carrot cake! Looks so healthy and delicious!! Wishing this were my breakfast this morning! Looks delicious, Kelly! Carrot cake for the breakfast…count me in! 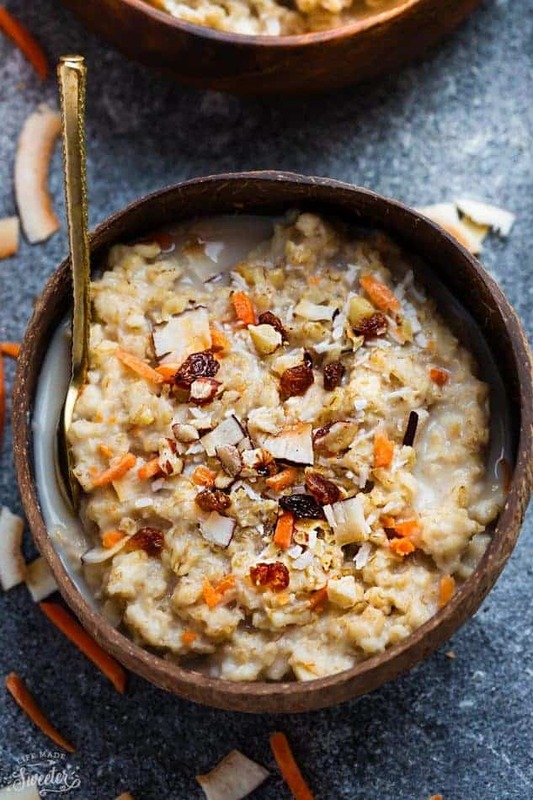 This oatmeal looks INSANELY good, Kelly! 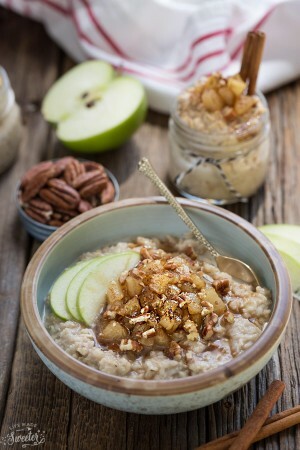 I could totally see myself making a huge pot of this for my oatmeal-lovin’ family! Such a great way to sneak veggies in! Oooh I totally pinned this! It looks so delicious and absolutely perfect for spring. Yay! I’m all for having carrot cake for breakfast! What a perfect spring breakfast! Breakfasts are one of my favorite meals. And I love carrot cake too. 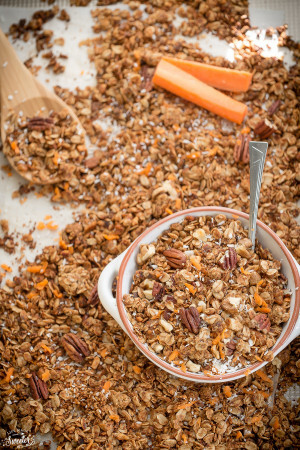 Absolutely loving the idea of combining carrot cake and oatmeal. I won’t mind to wake up to this pretty and delicious bowl every morning. I love carrot cake in any form, and I love this healthy breakfast version so I can enjoy it without the guilt! This looks so heart and delicious!